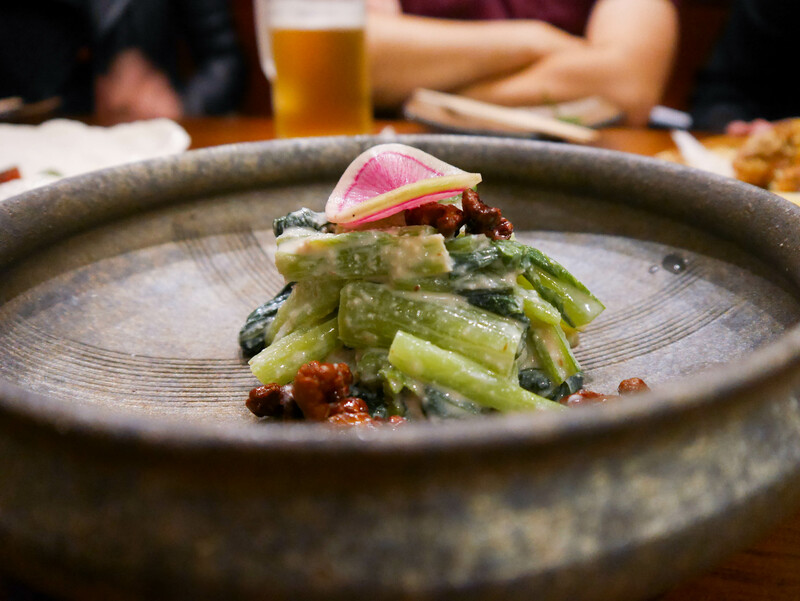 Chef Harunobu Inukai has long been part of the dining fabric here in Sydney and in Japan. His accolades include working at Hotel Nikko, InterContinental, Bilson’s and Ampersand in Sydney, and also for Robuchon in Osaka. These days (or the last ten to fifteen years or so) he is most known for his first restaurant, Blancharu and his first ramen stall, Ramen Ikkyu which had a bit of a cult following despite its innocuous Chinatown location. Now ‘Haru cuisine’ has evolved yet again, this time taking the name, Gaku, his newest venture in Darlinghurst. The restaurant’s full name is ‘Gaku Robata Grill’ but until council approval for the grill comes through, it’s currently trading as a robata-not-robata restaurant. For the moment, the menu reads much like a greatest hits album of Haru-san’s entire culinary career. 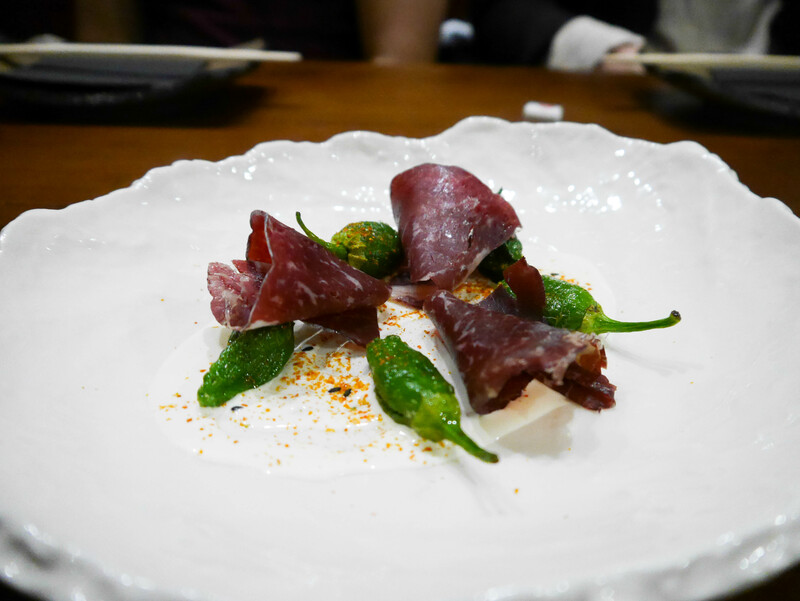 It’s a lot of fusion, like this bresaola with Padron Peppers and shichimi buttermilk. I surprised even myself for being the key instigator behind ordering the starter, blame it on some exceedingly good bresaola I had had the weekend before. I liked the combination of all three elements, but a few more slices of bresaola to go with each pepper would have nullified the raw taste and made each mouthful a little more robust. Shimon Hanakura of Aria fame, is the other half to Gaku. The nubbin I had was flavoursome, not too oily and with a discernible crunch sound that accompanied each bite. 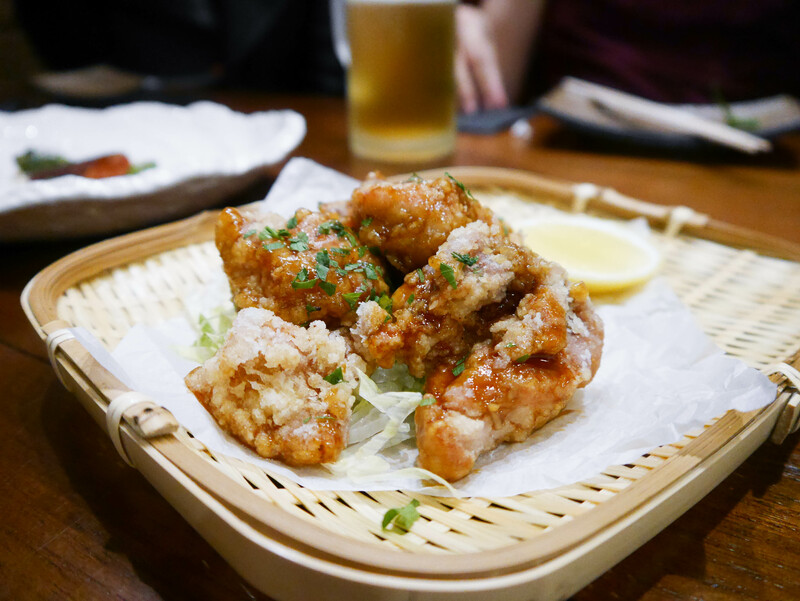 None of us are sure as to what the ‘2010’ in the name means, has his karaage been famous since 2010? Aged since 2010? Or is it simply from 2010 (the postcode for Darlinghurst)? Fried chicken has never made me think so hard. Sarah and I are adamant about incorporating vegetables into our dinner, which is what brings kurumi-ae to the table. I liked how same, same but different it is to the more well known goma-ae (spinach and sesame cream). Even better is how well the candied walnuts pair with it for a bit of sweetness. Our only lament is the portion-size. We would have been happy to order doubles of certain dishes, had the waiter told us that a single serve wouldn’t be sufficient for a party of five. 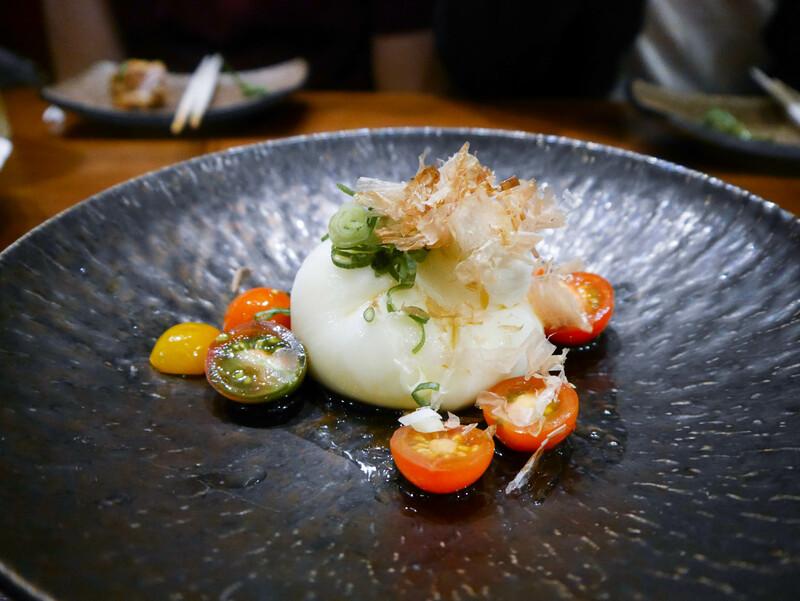 Burrata with an Asian cuisine twist is becoming more commonplace. Ms G’s ‘strange-flavour burrata’ comes to mind, as does Devon North Sydney’s eggplant burrata, dishes that borrow the creaminess and the form of cheese as a vessel to hold the flavours. 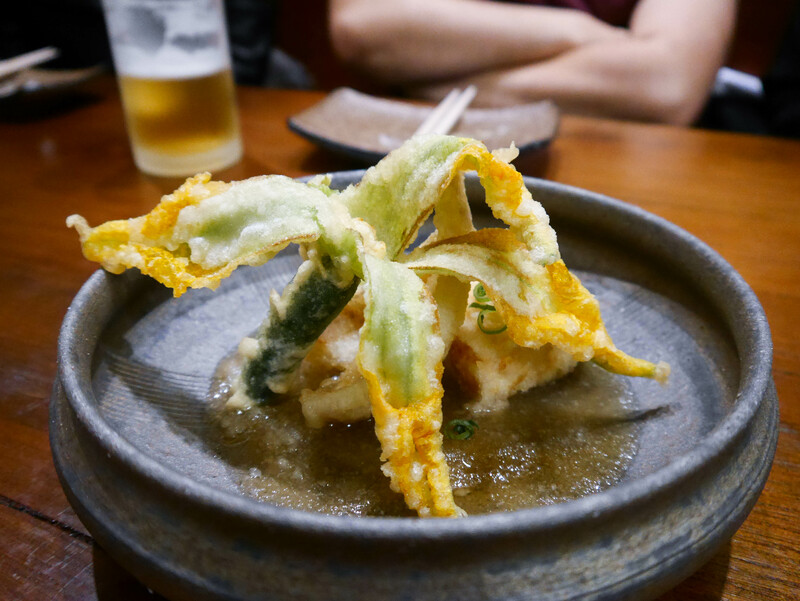 But while these restaurants have gone big and bold, Gaku’s ‘yakko’ rendition is much more pared back, with bonito flakes, soy sauce and spring onion. These are the toppings you would normally associate with hiyayakko, Japanese chilled tofu. The result is certainly the inverse, where the burrata’s flavour profile is welcomed and much more pronounced. I think I enjoyed it for the sheer fact that it’s a bag of gooey cheese but it was overall a bit too subtle in taste for me. I’m confident that a Japanese-inspired version is possible though, teriyaki burrata anyone? The agedashi tofu was weirdly enough, listed on the seafood component of the menu. But reading the fine print, you surmise that it’s likely because of the inclusion of the whiting, less so of the zucchini flower. Of the three deep fried items, the whiting wins out for me the most. 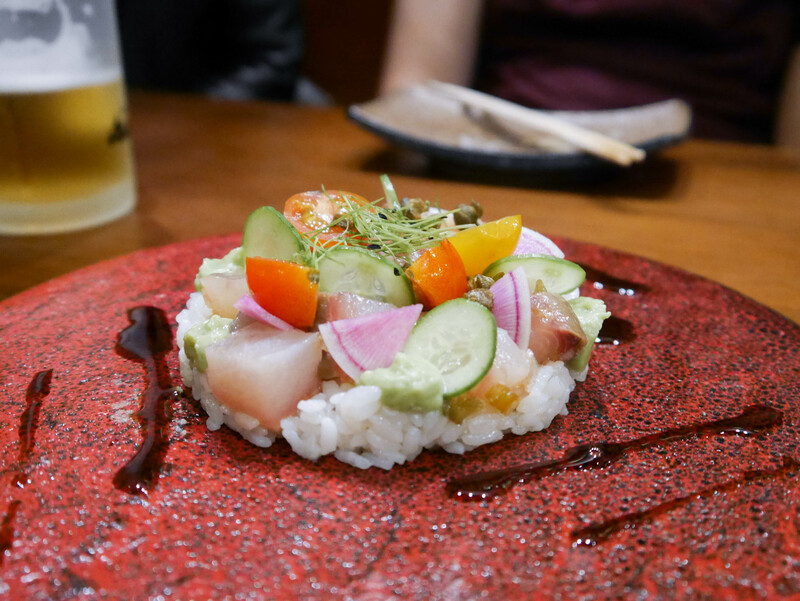 I never really caught on to the poke trend despite it being a natural fit for me (raw, seafood, vegetable-friendly) but I was interested to see how Gaku would interpret it. On the plus side, the cubes of hiramasa had a pleasing bounce to them and tasted incredibly fresh. On the minus, I’m not entirely sure all of the ingredients worked together and there was no discernible taste that spearheaded the dish. The duck was beautifully seared with a heady smokey profile. It went well with the sushi rice and the creaminess of the filling. I’d like to see this as a larger dish on its own, maybe with thicker slices of duck and a miso eggplant accompaniment on the side. There’s apparently fermented green mandarin as well which I can understand would be perfect to balance this out, but I don’t remember tasting much, or any of it. 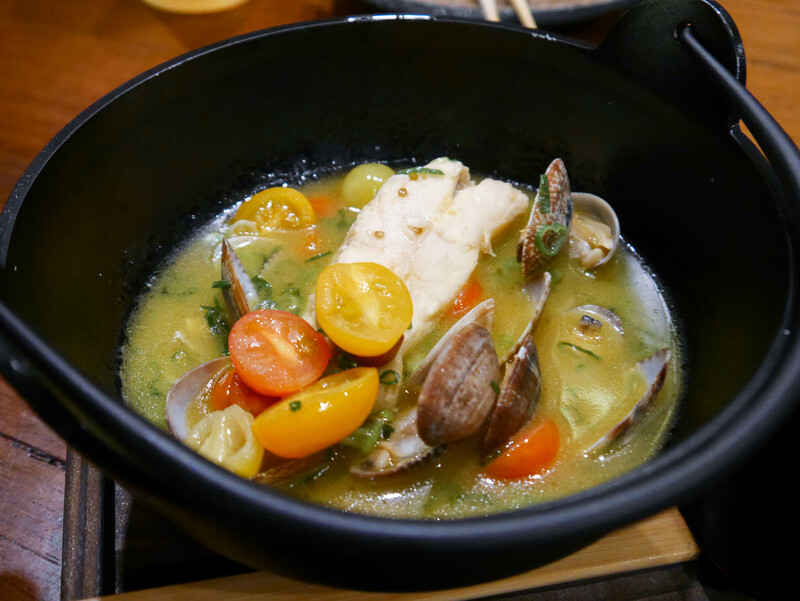 A brilliant broth with (what must be) butter mixed into it, this was like a really decadent steamed clams with sake. The clam meat was tasty and made a nice juxtaposition in the mouth when eaten with the tomatoes. The fish on that particular day was brill and strangely enough, we were told (and it’s written on the menu) that it’s a whole fish but we were served a fillet in our soup instead. Perhaps the rest of the fish was used in making the broth but it should be a little clearer on the menu. 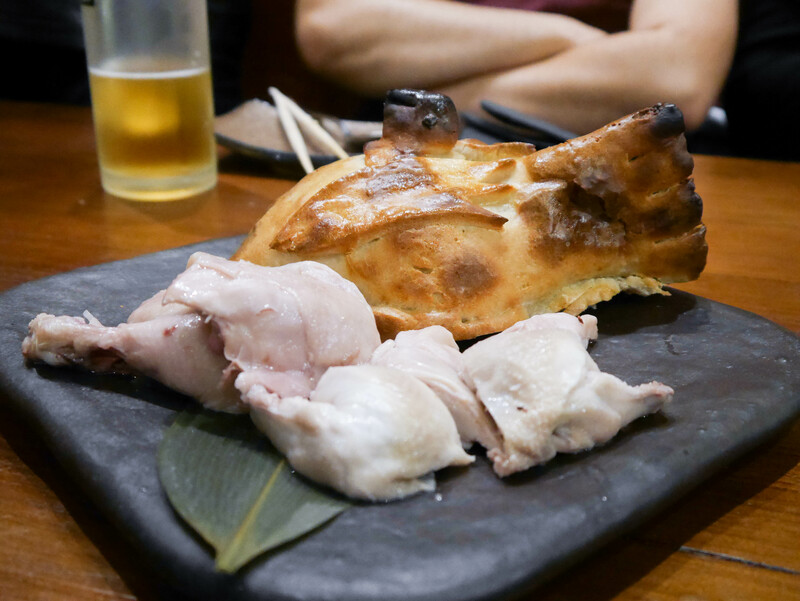 Our final order is Haru-san’s signature dish, his salt crusted spatchcock. This dish pre-dates even Blancharu. And while the technique might seem a little old school, its ability to deliver an incredibly luscious bird cannot be denied. Expect tender, juicy meat, no matter which part of the spatchcock you reach for. On top of Japanese-French fusion, Gaku is also dishing out bowls of ramen at lunch time. As a restaurant, this quaint modern Japanese restaurant encompasses every facet of Haru-san’s culinary identity. While there were some good dishes and some that I liked a little less, the overall dining vibe I felt is one of anticipation. It’s exciting that there’s still so much potential for growth and for pushing past boundaries, even from two incredibly seasoned chefs. I’ll be here, eagerly awaiting offerings from the robata. Loving these consistent posts Sam 🙂 Glad to have you back!! 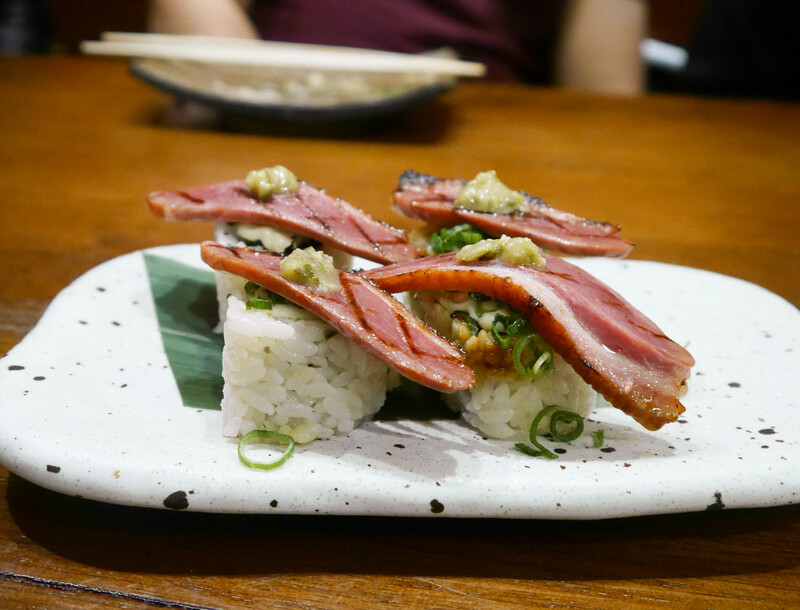 I’m intrigued by the Duck roll, that’s one thing I can say… I’ve never seen duck used in a dish closely resembling sushi, interesting! Thanks so much B! Hoping to be back for awhile this time. The duck was really flavoursome, it felt like a bit of a teaser of what may come once the robata grill is in! Oh whoa, some really looks-Japanese-but-not dishes here. I’m a bit concerned that there’s no ramen for dinner though, I was intending to hit it up next week for some slurpy goodness! Yeah, we would’ve loved some ramen that night as well, seems like two trips, lunch and dinner, are in order for a complete Gaku experience! I am so impressed of your work! Thank you so much Taizo san!